This handout photo shows Iranian President Hassan Rouhani (C), President Recep Tayyip Erdoğan (R), and Russia President Vladimir Putin (L) during a joint press conference after their a meeting. 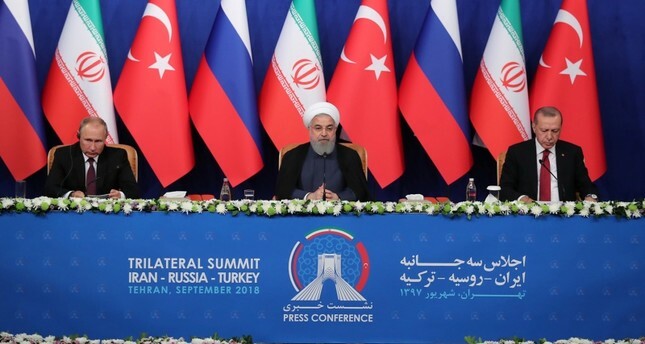 A joint statement has been issued after a trilateral summit meeting held between Turkey, Iran, and Russia in Iran's capital Tehran on Friday. The joint statement said, "There could be no military solution to the Syrian conflict and it can only end through a negotiated political process." The leaders expressed their "satisfaction with the achievements" of the Astana format since January 2017, in particular, the progress made in "reducing violence across the Syrian Arab Republic and contributing to peace, security, and stability in the country." Iran, Turkey and Russia "emphasized strong and continued the commitment to the sovereignty, independence, unity and territorial integrity of Syria, as well as to the purposes and principles of the UN Charter and highlighted that they should be respected by all." The leaders "rejected all attempts to create new realities on the ground under the pretext of combating terrorism," while expressing determination to stand against separatist agendas aimed at undermining the sovereignty and territorial integrity of Syria and national security of neighboring countries. The joint statement said leaders highlighted the "need to create conditions for the safe and voluntary return of refugees and internally displaced persons (IDPs) to their original places of residence in Syria." The next round of Syria talks between the three countries' leaders will be held in Russia, the statement said.